The Spanish Town Cathedral, also known as the St. Catherine Parish Church, was built in the second half of the seventeenth century. After the conquest of Jamaica by the British in 1655, the British destroyed the original Catholic Church and replaced it with the Anglican Church, which is now the St. Catherine Parish Church or the Spanish Town Cathedral. In 1712 the church was destroyed by a hurricane, but rebuilt in 1714. The church once contained the oldest Baptismal and Marriage Records in the island. It is also associated with important personalities in Jamaica some of whom are buried there - for instance, Sir Thomas Modyford, Governor 1664 - 1671, and the Earl of Effingham, Governor 1790 - 1791. The Cathedral is a mixture of many architectural styles combining round headed and pointed arches, classical quoins, and medieval buttresses. 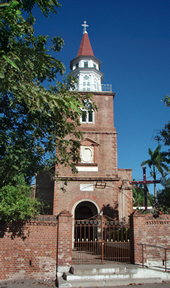 The tower, added in 1817, is crowned with one of the few steeples found in the Caribbean. The Morant Bay Courthouse, which was destroyed by fire on Monday, February 19, 2007, is an important part of St. Thomas's history. Select a region to start exploring or search for a day out near you. © Copyright 2011 Jamaica National Heritage Trust. All Rights Reserved.